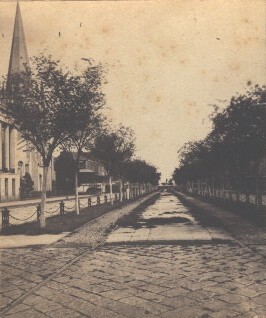 A stereo view of Canal Street, probably taken between 1861, when the Canal line was built, and 1868, when the Claiborne line was built and a second set of tracks was added to this view. We are looking in to the river, with the Henry Clay statue discernible in the distance. Compare this picture to Pictures 6 and 6.2. This picture was taken from the center of the neutral ground, Pictures 6 and 6.2 from the left edge of the neutral ground.